Home » @TheMintMuseum GENDERED: An Inclusive Art Show » TAG! You’re It! TAG! You’re It! 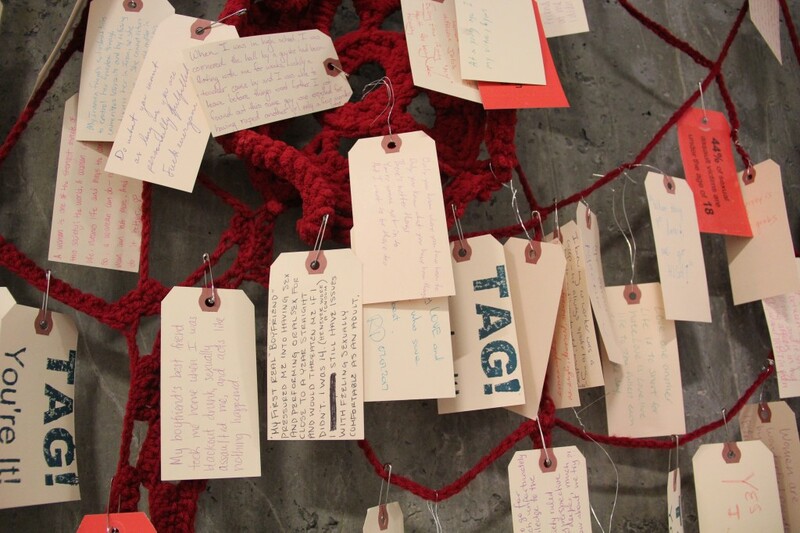 is a participatory installation asking the viewer to transcribe their personal stories in regard to some of the staggering numbers and statistics impacting women’s reproductive health, rights and issues onto manila shipping tags provided at the site. They are invited to hang their tags in response to the red tags, which contain a variety of statistics impacting women and those identifying as women. The climbing yarn and floral installation sculpture pays homage to the traditions of women’s handicraft that have often been relegated to a feminine pastime. The use of this media calls for an examination of the perception of materials, the meaning and hierarchies of value often associated with them and the connections of how society views women and the underclass. These choices emphasize women’s resilience even when circumstances or outside forces try to defeat us. Far from the childhood game of tag we all played as children, my intention is to provide an impetus for healing and awareness.